Precision accurate castings for demanding aerospace, medical and industrial applications from RapidProtoCasting. Accuracy refers to how close the measured value of a finished casting comes to the design engineering value. 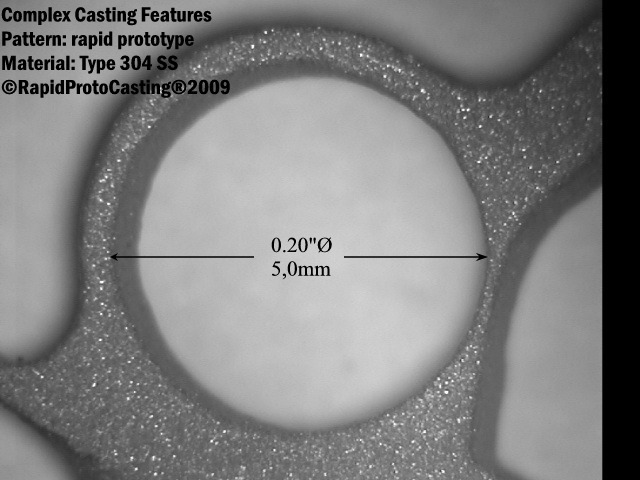 RapidProtoCasting can deliver castings with a mean variation from the design engineering value of less than 0.002″ (0,04mm) by adjusting the initial patterns size prior to ceramic investing. Precision refers to the reproducibility or repeatability of a specific dimension for a group of finished castings. 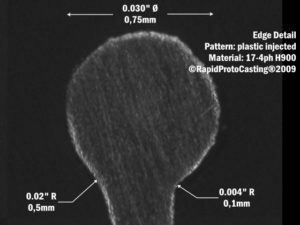 RapidProtoCasting can deliver finished precision castings with dimensional variations of +/- 0.002″ (0,05mm) or less following process development. Prototype castings manufactured using rapid prototype patterns will have casting accuracy and precision that will approximate production castings using wax-injected patterns. Prototype castings manufactured using machined plastic patterns may achieve casting precision and accuracy that may equal or exceed production castings manufactured using plastic-injected patterns. Production castings manufactured using injected plastic-injected patterns will provide the most precise casting accuracy and precision. Rapid Prototype Patterns with fine resolution x:y:z: IT14. Wax Injected Patterns with machine finish tooling: IT13. Plastic Injected Patterns with EDM finish tooling: IT11. For a complete discussion of general tolerance systems for castings please refer to our white paper RapidProtoCasting 200809 Standard Specifications for Casting Tolerances- Linear Dimensions. Process capability compares the measured dimension of a developed engineered casting to the limits specified by the design casting dimension and tolerances and is expressed by capability indices. A developed engineered casting is one of a set of castings produced using a fixed set of pattern and foundry processes to an agreed upon design dimension and specific or general tolerances. Process capability is the ratio of the length between the process minimum and maximum dimensions (the specification “width”) to the spread of the measured values around the design dimension as calculated using 6 standard deviations (the process “width”).